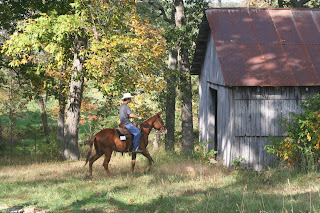 Cole and Jiggs running through the barn. 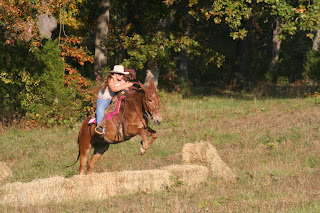 Cori and Hoosier Daddy jumping haybales. 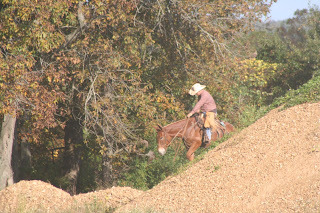 Loren and Jewels climbing the gravel pile. Brody Smith and Odie walking over the logs. Brody is 7 and the son of Jeff and Jennifer Smith. Loren and the kids decided to attend a local extreme cowboy race over the weekened. 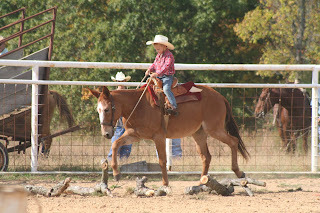 It was held by a little saddle club close to home. 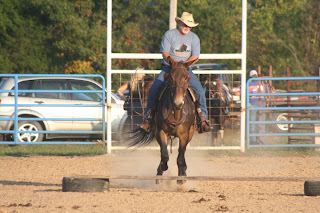 We had a couple from Iowa here for a short clinic with Loren this week and they took their mule and competed too. The course set was a pretty good course. It was set out in a circle basically so that part wasn't too hard to remember. The rules were a little weak and tended to change after we got started but also is normal for around here. We have found over the years that when we arrive at a "horse" event they are happy to take our money but they aren't going to let us take any of it back home. People aren't rude just uninformed. There was a little donkey showing at the race and a lady who couldn't control her horse at any time felt that the donkey scared her horse while she was in the arena. They provided some age divisions: 12 and under, 13 to 18, and 19 and over. The 12 and under division had the little kids dragging a tire around a barrel. This was a very bad idea. The rope was too long and the tire to light and when the kids got going it became almost airbound and scared the horses. The day was a lot of fun and we may or may not go back in the spring. I would hope some rules were in writing next time and we stuck to the rules. It's their ballgame and their ball, I guess they can make the rules up to suit them as they go along.